PlaSmart Inc., a Canadian-based, international distributor that selects products that are smart, simple, and fun is pleased to announce that Watermelon Ball® has been selected as a finalist for a 2018 TOTY award in the Outdoor Toy of the Year category. Watermelon Ball® is a neutrally buoyant ball that allows players to mimic moves found in football, rugby, and basketball, all underwater. PlaSmart is proud that Watermelon Ball® has been named a 2018 finalist for a prestigious TOTY award”, says CEO Tim Kimber. “The nomination is a tribute to Watermelon Ball® creator Jeff Larsen’s creativity and ingenuity. PlaSmart Inc., a Canadian-based, international distributor that selects products that are smart, simple, and fun is pleased to announce that Watermelon Ball® has been selected as a finalist for a 2018 TOTY award in the Outdoor Toy of the Year category. 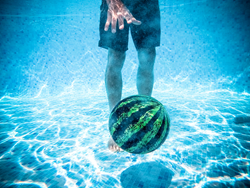 Watermelon Ball® is a nearly neutrally buoyant ball that allows players to mimic moves found in football, rugby, and basketball, all underwater. Known as the “Oscars” of the Toy Industry, the TOTY (Toy of the Year) awards program and its annual gala contribute much-needed funds to the Toy Industry Foundation. Those funds, in partnership with generous toy companies, make it possible for the Foundation to deliver new toys to millions of needy children throughout the year. Toy and play experts, retailers, academics, and journalists reviewed and ranked over 600 nominated products to choose TOTY finalists in each of 17 categories. Each product’s creativity, design, play value, and marketing were then considered in live discussions. Between now and January 5, 2018 consumers can visit http://www.ToyAwards.org to vote for their favorite picks. Many people will remember playing watermelon ball, using real watermelons, at summer camp or in backyard pools. 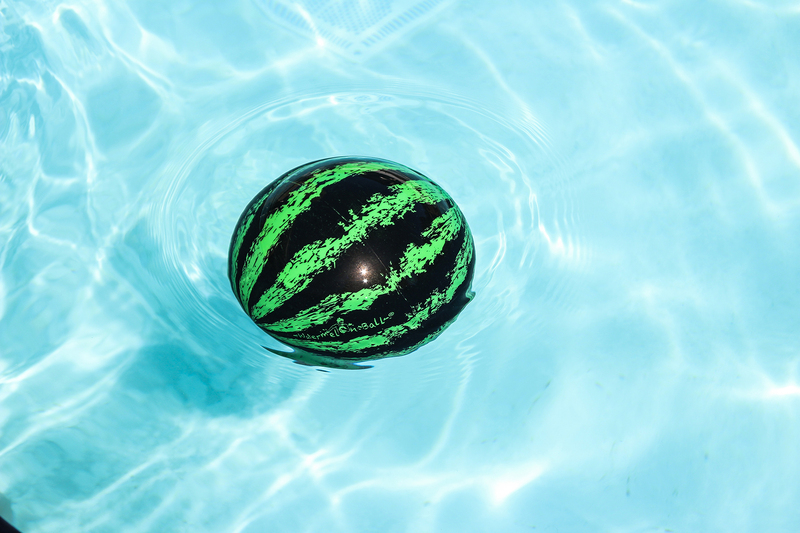 Watermelons are nearly neutrally buoyant; first sinking in water and slowly floating to the surface. This characteristic makes them ideal for playing all kinds of water games. 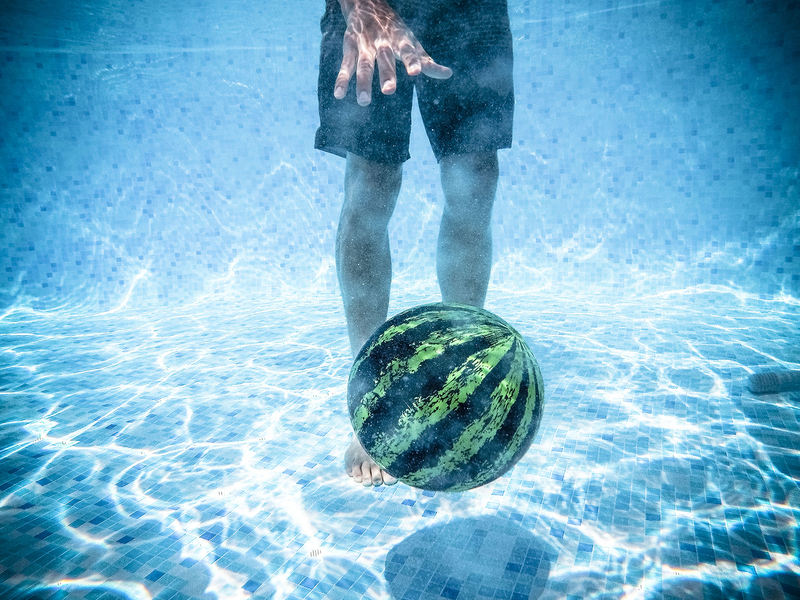 The 9-inch diameter Watermelon Ball™ was designed to look, feel, and behave like a watermelon in water and, additionally, allows players to dribble, kick, bounce, pass, and intercept underwater. Watermelon Ball™ is extremely durable and stands up to repeated intense use; features that were sorely missing with watermelon fruit. 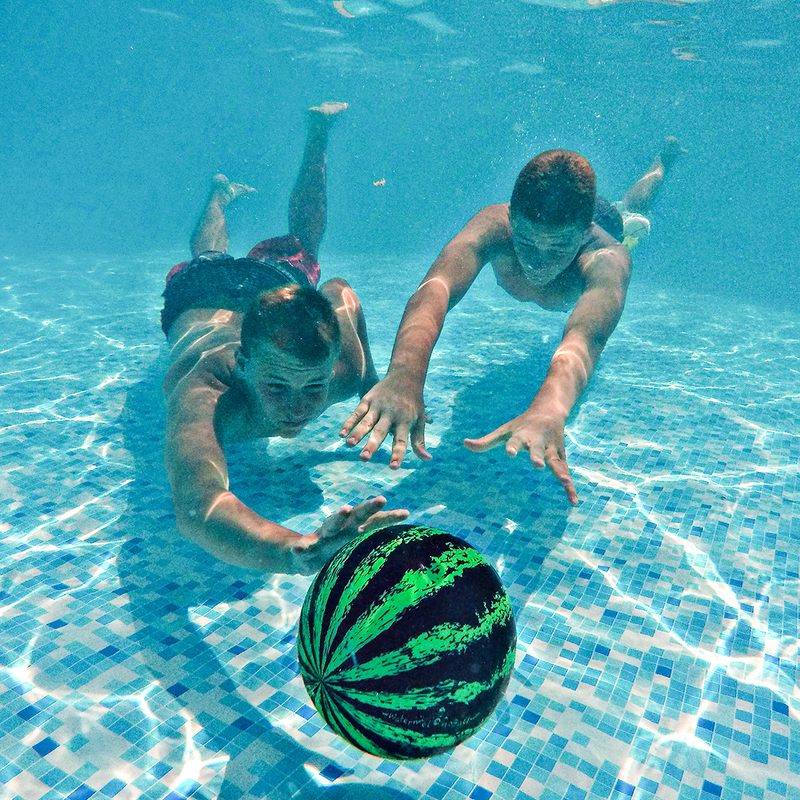 The development of Watermelon Ball® began in 2004 with a group of college students who frequently got together to play a swimming pool game that used real watermelons. The intensity of play caused the watermelons to crack, and sometimes accidentally smash. Concerned that they were making a “pretty good mess”, as well as spending a lot of money on watermelons, one student, Watermelon Ball® creator, Jeff Larson, devised a creative solution. He designed a ball that looked and behaved like a watermelon, but could withstand intense play. Jeff Larson’s idea to fill Watermelon Ball® with water, instead of air like most other sports balls that required inflation, allowed the new ball to be nearly neutrally buoyant, sinking to the bottom and slowly rising to the top like real watermelons. The student watermelon ball sessions continued using the tough, new Watermelon Ball® and competition became more fun than ever. In fact, the artificial Watermelon Ball® allowed for increased strategy, dribbling the ball on the bottom like a basketball, kicking as in soccer, football like moves and interceptions, and even passing up to ten feet underwater. And, without the danger of cracking or smashing, Watermelon Ball’s® rugged construction withstood being bounced off pool walls to teammates. In January of 2017, PlaSmart Inc. and Jeff Larson signed a world-wide license agreement to market Watermelon Ball® and an aggressive marketing strategy by PlaSmart ensued. Watermelon Ball was first introduced at 2017 Toy Fair in New York. A very active and successful blogger and social media campaign, print advertising, a Today’s Launch on The Grommet, and many other initiatives by PlaSmart’s sales team support Watermelon Ball®. PlaSmart Inc. is a Canadian-based, global toy distributor that selects products that are smart, simple, and fun. It seeks out interesting, one-of-a-kind toys that meet its 'smart and simple' philosophy and avoids toys that are difficult to understand or operate. PlaSmart will celebrate its 15th year of distributing Smart, Simple Toys in 2018. The company’s products include multiple award-winning toys and games, including the ever-popular Original PlasmaCar®, a mechanical marvel powered by the cleanest and most inexhaustible energy source, kid power; The Original DoodleArt® adult coloring kits; and Smart Mat™ multi-purpose play mats. PlaSmart’s products are available on five continents and in more than sixty countries. For more information visit PlaSmart’s website.